The "Memorial to Women in Times of War" was unveiled on October 12, 1996. It is the first national memorial honouring and commemorating the work done by women during the wars of 1939-1945. The work belongs to the collections of the Helsinki Art Museum. The sculpture comprises an 8-metre steel tower and a 7.5-metre wide slab cut from grey Kuru granite. The slab contains reliefs depicting women working at the home front in homes, factories, at farms, in various institutions and on the war front. The female figures portray the vital work done by women during the wars and the burdens inflicted whilst 400,000 men were fighting on the frontline. The inscription reads: "In honour of women in times of war". The years 1939-1945 are entered in gold letters between the reliefs. In his speech at the unveiling, Ensio Hukkataival, the Chairman of the Memorial Committee, described the steel tower as a representation of both threat and, in its ascending form, a brighter future. The planning of the memorial was instigated in 1985 by veterans' organizations, families of the fallen and other non-governmental organizations. In the original proposal, the monument comprised several female figures in bronze located in the park of the Hakasalmi villa close to the Finlandia Hall, but in 1989 the City Council designated the rocks on Porthaninrinne for the memorial. The work was commissioned from Heikki Häiväoja who designed a more symbolic monument than originally proposed. Other works by Heikki Häiväoja (b. 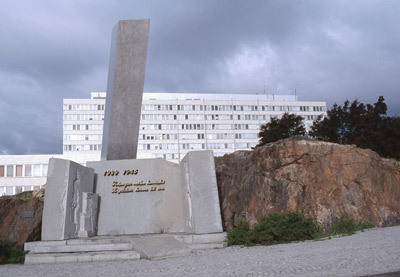 1929) include "Urbanist", "Memorial to Adolf Erik Nordenskiöld", "Cooperation monument" and "Concrete Symphony".